Photo by Bryan Stevens • The downy woodpecker ranked among the 10 most frequently reported birds on the 2017 Great Backyard Bird Count. A record number of 173,826 people took part in this year’s GBBC, which was held Feb. 17-20. In announcing the results of this year’s Great Backyard Bird Count, organizers of the annual global bird survey shared an anecdote about a second-grade student in Memphis, Tennessee. The girl, who obviously enjoyed making a contribution as a citizen scientist for the GBBC, made a real connection with the birds she was being asked to count. Calling her participation the “best day of her life,” the girl went on to share her excitement about seeing a downy woodpecker. She was hardly alone in seeing this small woodpecker. 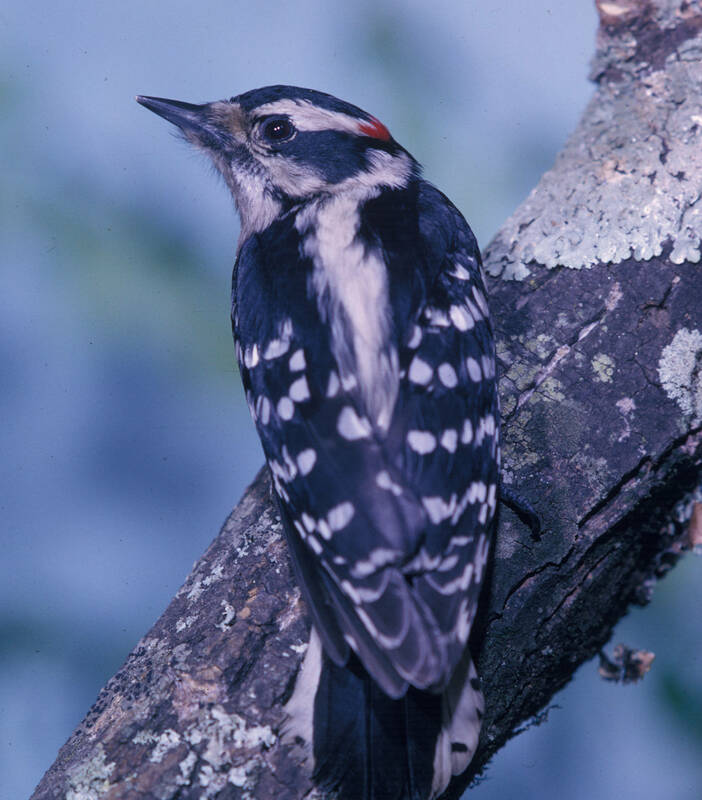 A total of 38,760 checklists across the country included downy woodpecker with their totals. The girl’s joy at discovering a downy woodpecker — a bird that was completely new to her — all but guarantees that she will look forward to taking part in the 2018 GBBC. If her interest in birds continues to develop, she just may catch the birding bug herself. Photo by Bryan Stevens • Counting crows and other birds at Shook Branch at Watauga Lake during the recent GBBC. The 2017 Great Backyard Bird Count is now part of the history books, and thanks to participants from around the world, this year’s GBBC ranked as the biggest count in its 20-year history. Participants set a new high bar for number of checklists submitted and total number of species reported. An estimated 214,018 participants took part this year, compared to the 2016 final total estimate of 163,763 individuals. An incredible total of 5,940 different species was tallied by GBBC participants, which is a dramatic spike from last year’s total of 5,689 species. That record number of participants also turned in a record number of completed checklists — 173,826, compared to the final total of 162,052 in 2016. The three states with birders submitting the most checklists were, in descending order, New York, Pennsylvania and California. Incidentally, Virginia came in sixth, with 5,190 checklists submitted during the 2017 GBBC. North Carolina came in ninth with 4,220 checklists submitted by 2017 GBBC participants. Birders in Tennessee will need to step up for future counts. The Volunteer State ranked 20th on the list with 2,215 checklists submitted. The states seeing the most species of birds reported were, in descending order, California (370 species), Texas (360 species) and Florida (309 species). North Carolina checklists indicated a total of 213 species to land the Tar Heel State at No. 8 on the list of states with most species reported. Virginia, in 12th place, tallied a total of 196 species. Tennessee came in 32nd place with 136 species, which isn’t too bad for a landlocked state. In North America, the most numerous birds reported on the count included several species of geese, as well as blackbirds, starlings and crows. A total of 4,793,261 snow geese made this bird the most numerous North American species reported on the GBBC. Other common birds, in descending order, included red-winged blackbird with 2,464,572 individual birds tallied, as well as Canada goose, 1,895,077; European starling, 919,038; mallard, 715,594; ring-billed gull, 647,950; American coot, 500,261; greater white-fronted goose, 426,040; common grackle, 416,720; and American crow, 378,483. During my participation this year, I saw several of these species, including red-winged blackbird, Canada goose, European starling, mallard, ring-billed gull and American crow. 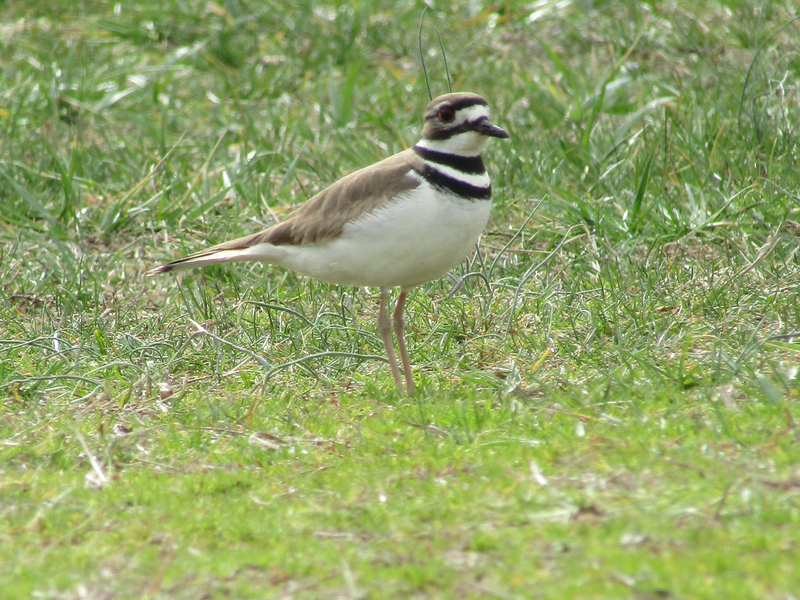 Photo by Bryan Stevens • Killdeer in Limestone Cove during the Great Backyard Bird Count held last month. The ten most frequently reported species, in descending order, were Northern cardinal, American crow, mourning dove, dark-eyed junco, downy woodpecker, blue jay, black-capped chickadee, house finch, house sparrow and white-breasted nuthatch. While taking part in the GBBC last month, I saw all these species with the exception of the black-capped chickadee. Instead, my submitted checklists featured Carolina chickadees. The birds on the most frequently reported list are almost without exception birds of yards and gardens, making them more likely to be counted by more individual participants. On the other hand, the most numerous, or abundant, birds are those that join together to form large flocks. They’re widespread, but less likely to be encountered in yards and gardens. I counted at home and at several favorite birding locations. During a visit to Watauga Lake in Carter County, Tennessee, my mother and I observed an immature bald eagle and a yellow-bellied sapsucker, which turned out to be among my personal GBBC highlights this year. I always enjoy looking for birds during the four-day count period. I also like to feel that I am contributing to a shared knowledge about birds and their populations. Photo by Bryan Stevens • Buffleheads on the Watauga River during the recent GBBC. If you would like to view photos of birds from around the world that were taken during this year’s GBBC, visit gbbc.birdcount.org/photo-subs-2017/. If you didn’t get to take part this year, be sure to plan ahead for next year when the GBBC will be held Feb. 16-19, 2018. Help make next year’s count another one for the record books. This entry was posted in Birding, Birds, Great Backyard Bird Count, Uncategorized and tagged Birding, Birdwatching, Bristol Herald Courier, Bryan Stevens, Carter County Compass, Elizabethton Star, Erwin Record, Feathered Friends, Great Backyard Bird Count, McDowell News, Northeast Tennessee, Our Fine Feathered Friends, The Erwin Record, Winter birds on March 19, 2017 by Bryan Stevens. Photo by U.S. 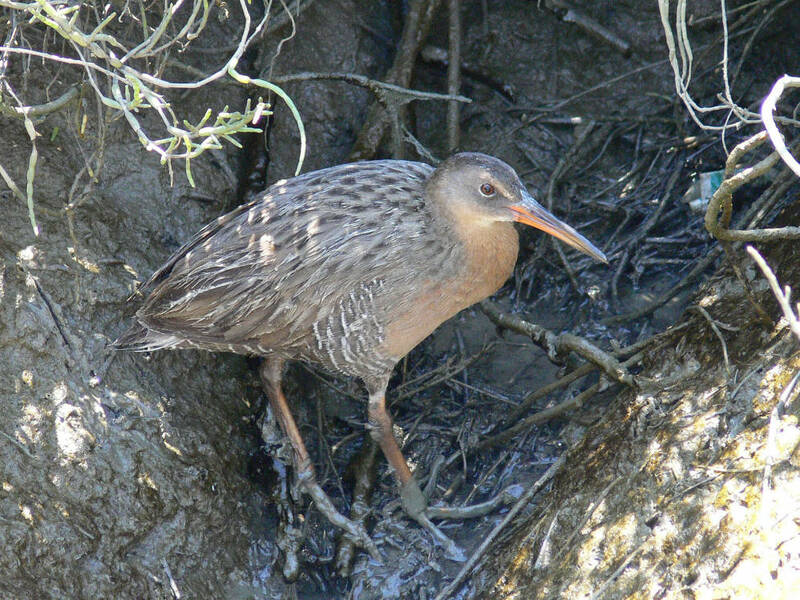 Fish & Wildlife Service/Lee Karney • The Clapper Rail is abundant in saltwater marshes and mangrove swamps from Massachusetts to South America. 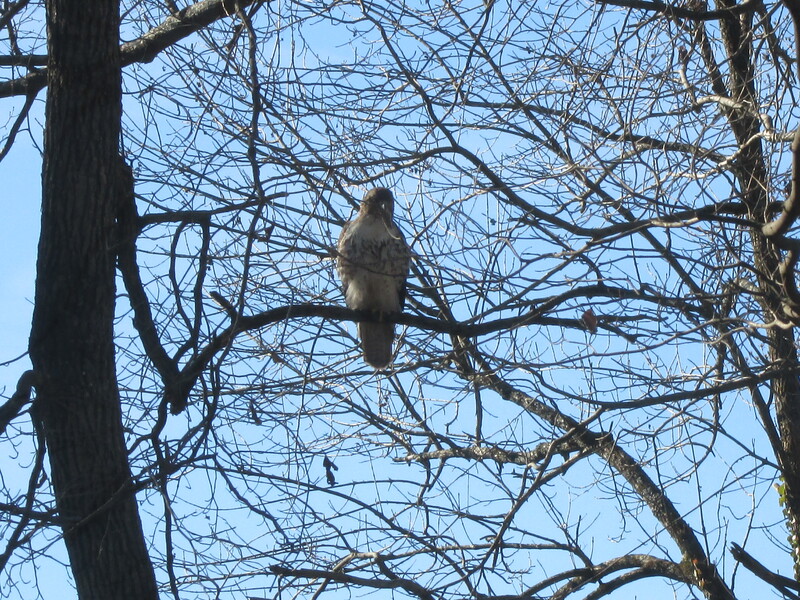 Observant participants in the Great Backyard Bird Count are sure to find some of these reclusive birds. I look forward every year to the annual Great Backyard Bird Count, a survey established as a citizen science project back in 1998. Since 2013, the GBBC has been a global effort, allowing birders around the world to take part. Participants in 2015 observed almost half of the world’s known bird species, and that effort was surpassed just last year during the 2016 count. Over the years, I have counted various interesting birds, including green-winged teal, Ross’s goose, snow goose, American kestrel and Cooper’s hawk, while taking part in the GBBC. The GBBC is a joint project of the Cornell Lab of Ornithology and the National Audubon Society with partner Bird Studies Canada. With its global perspective, a great many exotic bird species are now tallied on the annual GBBC, but the survey remains firmly established as a grassroots effort to compile data crucial for the conservation of the world’s beloved birds. The information gathered by tens of thousands of volunteers helps track the health of bird populations at a scale that would not otherwise be possible. Photo by U.S. 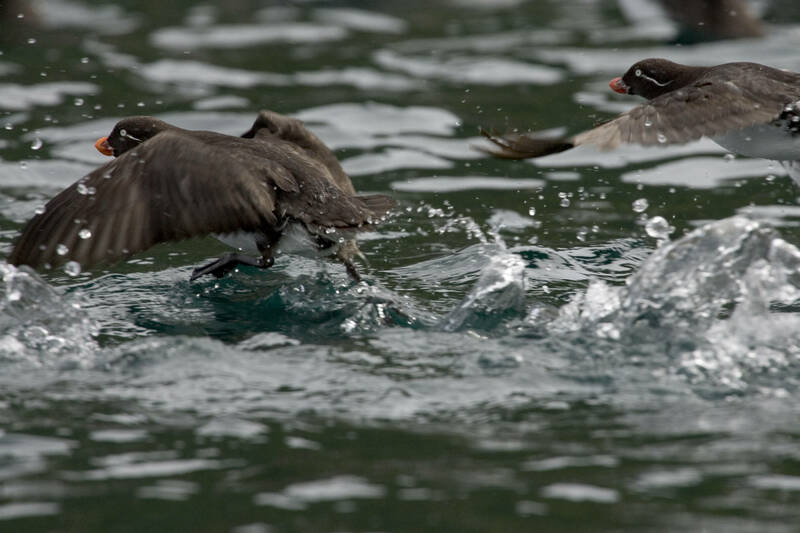 Fish & Wildlife Service/Steve Hillebrand • Parakeet Auklets in flight in the Alaska Maritime National Wildlife Refuge. The Great Backyard Bird Count extends beyond North America and now covers the entire globe. It’s incredibly easy to take part in the GBBC. Anyone anywhere in the world can count birds for at least 15 minutes on one or more days of the four-day count period and enter their sightings at http://www.BirdCount.org. There’s no charge or fee for taking part in the GBBC, which is a fun way to observe a variety of birds. Thanks to the flexible count criteria, it is also an easy way to make a contribution to science. The data delivered by the thousands of participants is now collected and compiled by the website ebird.org. This year’s GBBC will be held over a four-day period, starting on Friday, Feb. 17, and continuing through Monday, Feb. 20. Participants are invited to count birds at their own homes in their yards and gardens. They can also travel farther into the field, birding in their favorite parks, wildlife refuges or other birding hot spots. Participants can count alone or join with groups of fellow birders. Those taking part in the GBBC are invited to count in as many locations as they like. The reported results will help create a real-time snapshot of where birds are distributed during the winter months. Photo by U.S. 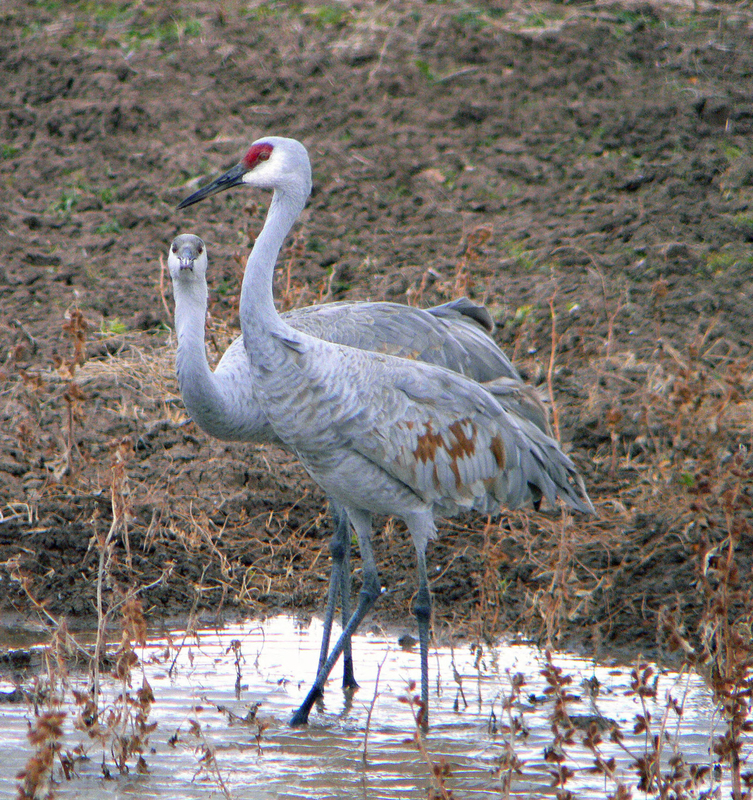 Fish & Wildlife Service/Lee Karney • A pair of Sandhill Cranes in a New Mexico wetland. The 2016 Great Backyard Bird Count saw 142 species of birds reported in Tennessee. In Virginia, a total of 177 species was counted by participants in the annual survey. The Old Dominion State has a distinct advantage over landlocked Tennessee in having ample coastal access to the Atlantic Ocean, which helps explain the more than 30 additional species tallied in Virginia. Birds like brown pelican, American oystercatcher, Northern gannet, purple sandpiper and great black-backed gull represented finds not found in Tennessee. Both states were outpaced by GBBC participants in North Carolina, who managed to find an incredible total of 213 species, including red-cockaded woodpecker, little blue heron, razorbill, brant, parasitic jaeger, Northern fulmar and Western tanager. 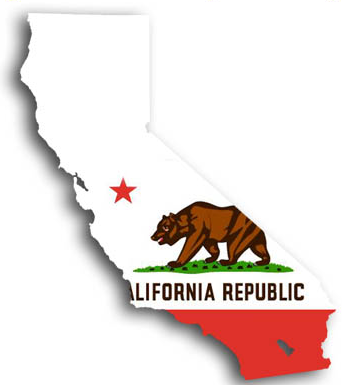 Overall, the top three species-rich states were Florida (323), Texas (359) and California (369). In the lower 48 states of the United States, a total of 616 species of birds were reported for the 2016 GBBC. Photo by U.S. 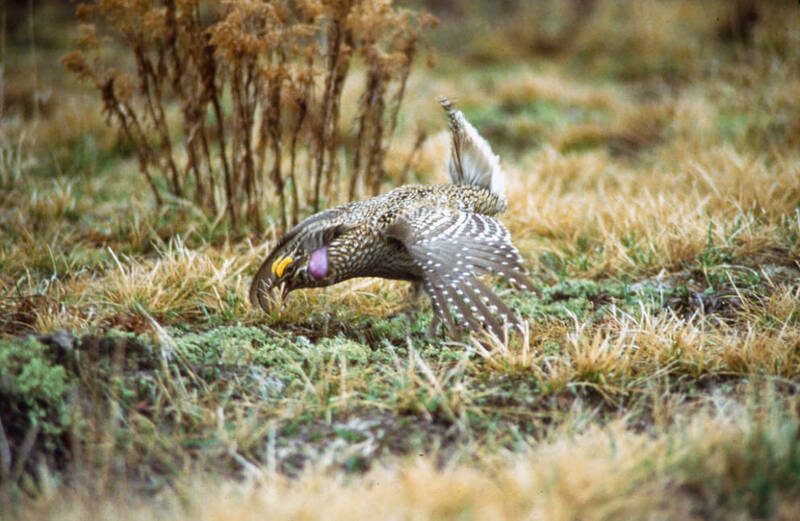 Fish & Wildlife Service/Richard Baetsen • Sharp-tailed grouse engaged in a mating display. Keeping track of populations of vulnerable species is a major component of the annual GBBC. The 2016 GBBC shattered records. An estimated 163,763 bird watchers from more than 130 countries joined the effort. Participants submitted 162,052 bird checklists reporting 5,689 species, which is more than half the known bird species in the world and 599 more species than the previous year. So, what results will 2017 produce? Social media, like Facebook and Twitter, have helped raise awareness about the importance of the GBBC, which has proven helpful in tracking long-term population trends of North American birds, as well as the bird populations on other continents. If anything, counting birds during the GBBC is an easy way to do your part to advance the cause of science intended to improve the plight of our beloved birds. So, circle the dates on your calendar and join me in taking part in the upcoming Great Backyard Bird Count. For more information on the Great Backyard Bird Count, visit www.BirdCount.org. This entry was posted in Birding, Birds, Great Backyard Bird Count, Great Horned Owl, Winter birds and tagged Birding, birds, Bristol Herald Courier, Bryan Stevens, Carter County Compass, Christmas Bird Count, Elizabethton Star, Erwin Record, Feathered Friends, Great Backyard Bird Count, McDowell News, Northeast Tennessee, Our Fine Feathered Friends, Songbirds, The Erwin Record, Winter birds on February 12, 2017 by Bryan Stevens. Photo by Bryan Stevens A Fox Sparrow lifts one foot into its belly feathers on a cold morning in reaction to bitter cold.The cold weather that closed out the month of February in the region also marked a shift in the seasons. The frigid temperatures, snow and ice also brought increased traffic to feeders. 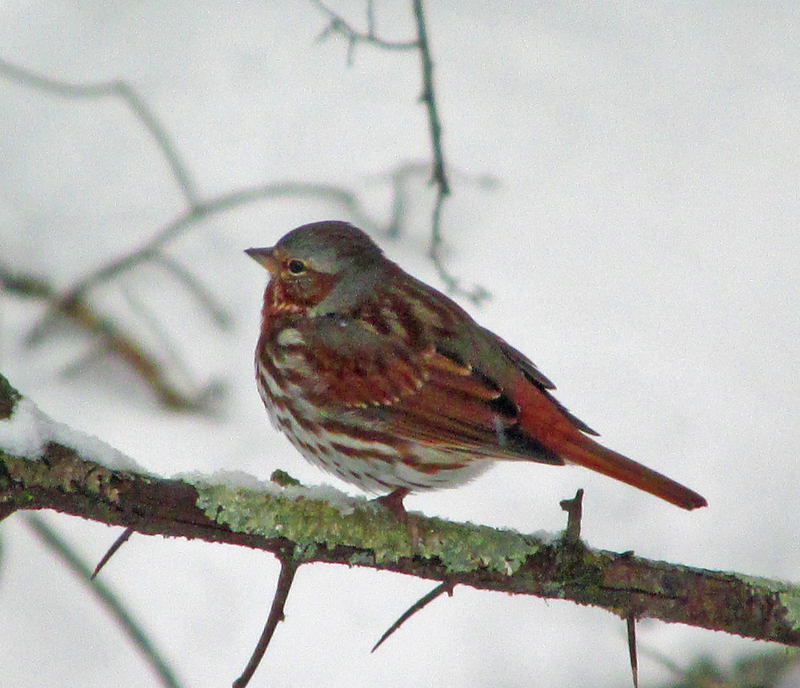 One of the recent new arrivals at my home during the last of the February storms was a fox sparrow, who fed along with such birds as purple finches, pine siskins, American goldfinches and dark-eyed juncos. In North America, the sparrows are classified in the Emberizidae family, which also includes the buntings, cardinals, grosbeaks and tanagers. The American, or New World, sparrows are a diverse group of seed-eating songbirds with conical bills. Many of them are brown or gray in color, leading to the term “little brown birds” being used to describe a family of similar birds. On closer study, each species of sparrow is quite unique, with many of them having distinctive head patterns or splashes of color apart from the dull browns and grays. Photo by Bryan Stevens Fox Sparrows prefer to remain in thickets and tangle of thick cover. 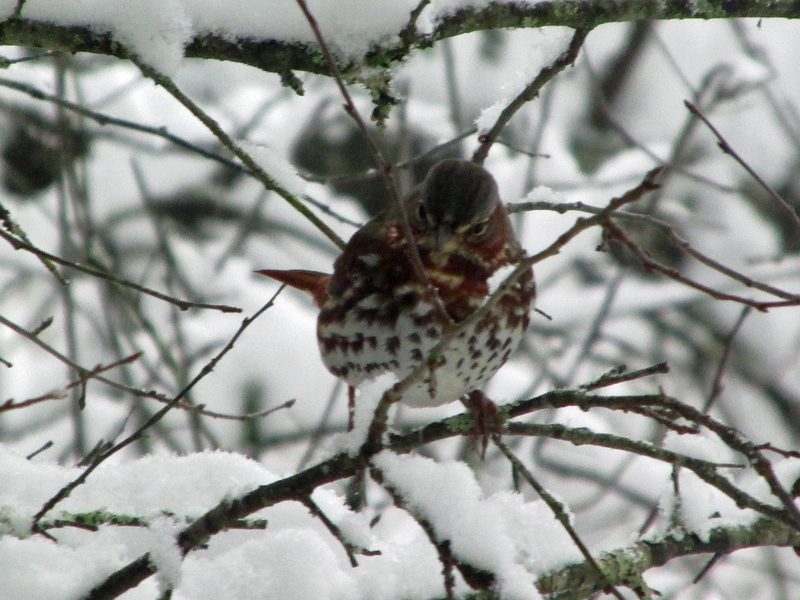 Heavy snows will often bring this sparrow to backyard feeders. Although they share the name “sparrow,” American sparrows are more closely related to Old World buntings than they are to the Old World sparrows. In fact, the only true Old World sparrow in Northeast Tennessee is the House Sparrow, which was introduced to the United States and is not a native bird. Worldwide, there are many superstitions connected with birds commonly known as “sparrows.” In the book The Folklore of Birds, author Laura C. Martin notes that in China the sparrow is a foreteller of good luck. She also points out that in Japan the sparrow is a symbol for gentleness, gratitude and joy. Keep in mind, however, that sparrows in Japan and China are not among the same family of birds known as sparrows that are found in the United States. In fact, with a few exceptions, our native sparrows are unique to North America. Photo by U.S. Fish & Wildlife Service A Fox Sparrow perches on a bare branch. These large sparrows are only winter visitors in Northeast Tennessee. 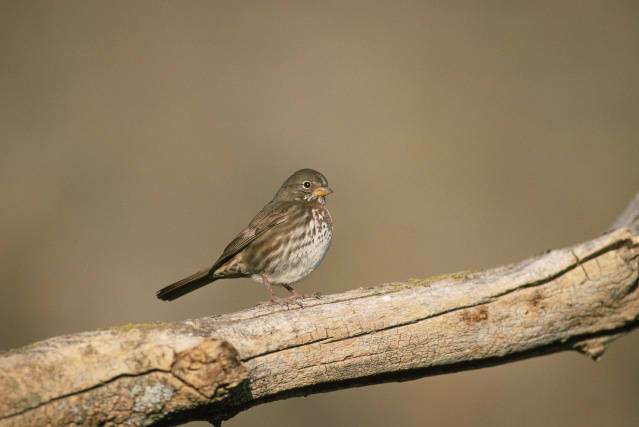 For instance, the fox sparrow is a large, plump bird that in many parts of North America is most familiar as a migrant or wintering bird. 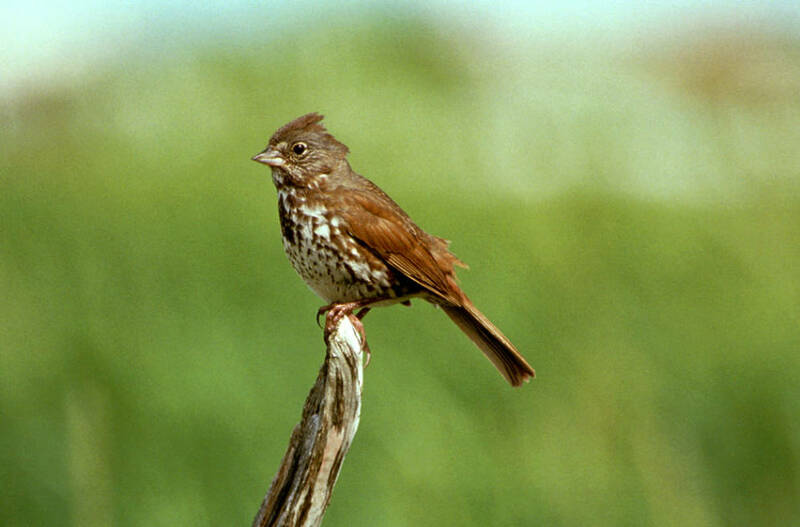 The fox sparrow has a rusty tail and a streaked breast, evocative of a fox, hence its common name. Its plumage is dominated by brick-red and gray feathers. In addition to a rather distinctive appearance for one of the so-called “Little Brown Birds,” the fox sparrow can easily be recognized by its behavior, too. This bird has a vigorous, distinctive way of foraging on the ground, kicking backward with both feet to uncover food. In fact, the instinct to forage in this manner means they are most often seen on the ground below a feeder instead of perched on a feeder like other birds. Photo by U.S. Fish & Wildlife Service A Fox Sparrow perches on a branch, giving a good view of the rusty-red plumage that inspired its common name. I’ve noticed over the years that February and March is usually the best time of the year to observe this winter sparrow. Even when these large sparrows are present, it often takes a heavy snow to bring them out of their tangled thickets to our feeders. Other sparrows are less frequent visitors to yards, and can most often be found in the region during the migration season. These sparrows of the transitional periods between the seasons include savannah sparrow, vesper sparrow and swamp sparrow. March and April are good times to look for these sparrows. Most fox sparrows spend the nesting season in remote, fairly inaccessible locations as far north as Alaska and Canada. As a result, most people only see these birds during the winter months when they can become very reliable visitors to feeders. 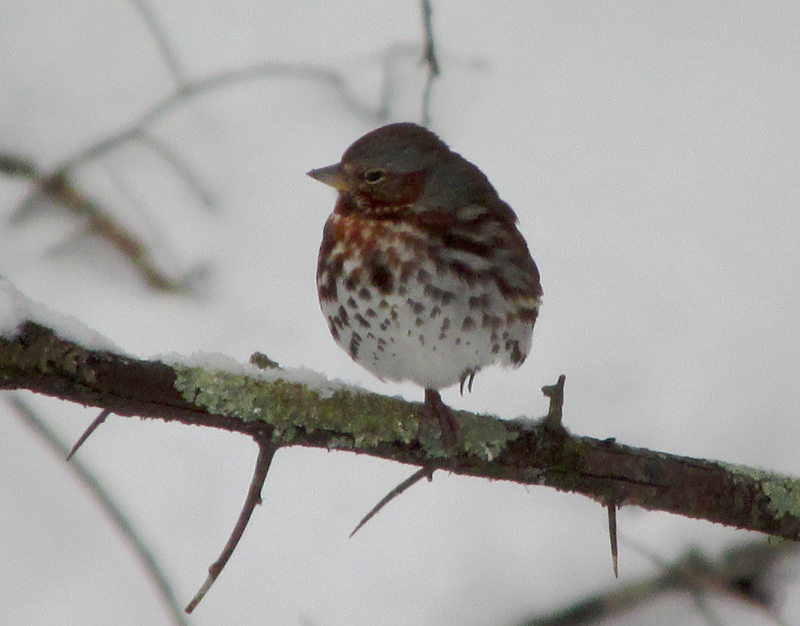 The recent heavy snows at the end of February brought a single fox sparrow to my feeders. The bird arrived early each morning and usually didn’t extend its visit beyond mid-afternoon. Bryan Stevens lives near Roan Mountain, Tennessee. Friend him on Facebook at https://www.facebook.com/ahoodedwarbler. He is always posting about local birds, wildlife, flowers, insects and much more. If you have a question, wish to make a comment or share a sighting, email ahoodedwarbler@aol.com. Photo by Bryan Stevens A heavy snowfall often prompts Fox Sparrows to visit backyard feeders, although they prefer to feed on the ground below the feeders. They kick vigorously to uncover fallen seeds covered by snow or leaves. This entry was posted in Birding, Birds and tagged Birding, birds, Bristol Herald Courier, Carter County Compass, Elizabethton Star, Erwin Record, Feathered Friends, Fox Sparrow, Great Backyard Bird Count, Our Fine Feathered Friends, The Erwin Record on March 8, 2015 by Bryan Stevens. Organizers are inviting citizen scientists around the world to give Mother Nature a valentine this year and show how much they care about birds by counting them for the yearly Great Backyard Bird Count. 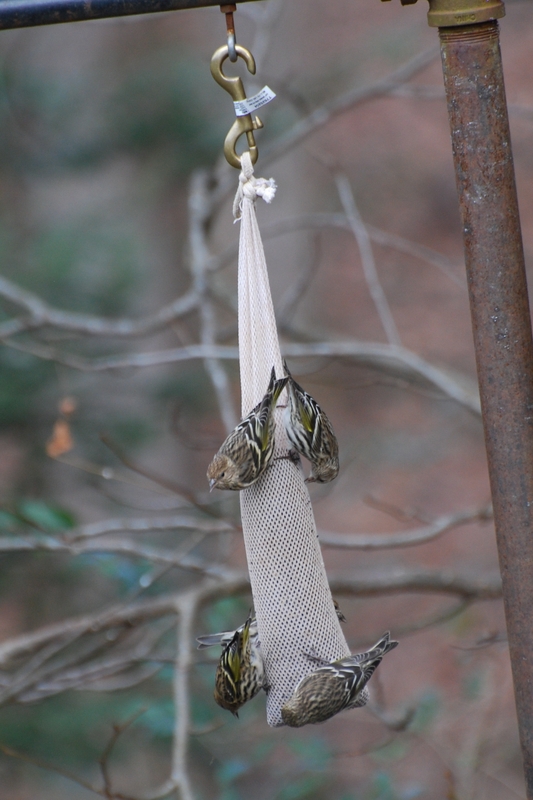 Photo by Jean Potter Pine Siskins flock to a sock filled with thistle seed. These finches, prone to irruptions every few years, could be quite common during this year’s Great Backyard Bird Count. The 18th annual count is taking place Feb.13-16. Anyone in the world can count birds at any location for at least 15 minutes on one or more days during this four-day count and enter their sightings at http://www.BirdCount.org. The information gathered by tens of thousands of volunteers helps track changes in bird populations on a massive scale. The GBBC is a joint project of the Cornell Lab of Ornithology and the National Audubon Society with partner Bird Studies Canada. Two years ago, the GBBC shattered records after going global for the first time, thanks to integration with the eBird online checklist program launched in 2002 by the Cornell Lab and Audubon. Participants reported their bird sightings from all seven continents, including 111 countries and independent territories. Participants came from a range of far-flung locations from from Afghanistan to Zimbabwe. More than 34.5 million birds and 3,610 species were recorded, thereby documenting nearly one-third of the world’s total bird species in just four days. Last year, bird watchers fell in love with the magnificent snowy owl when these impressive birds were reported in unprecedented numbers across southeastern Canada, the Great Lakes states, the Northeast, and along the Atlantic Coast. Organizers anticipate snowy owls will show up in higher numbers during this year’s GBBC, too. Photo by U.S. 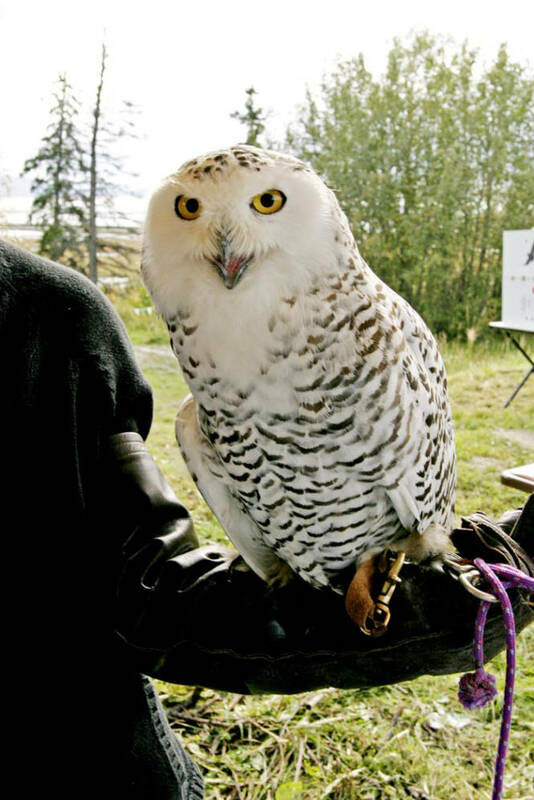 Fish & Wildlife Service A Snowy Owl, held in captivity after suffering injuries that left it unreleasable, now educates people about the lives of birds of prey. Owls are not the only birds that will motivate birding enthusiasts to get into the field this February. Bird watchers from 135 countries participated in the 2014 count, documenting nearly 4,300 species on more than 144,000 bird checklists – that’s about 43 percent of all the bird species in the world! In addition to the U.S. and Canada, India, Australia, and Mexico led the way with the greatest number of checklists submitted. Photo by U.S. Fish & Wildlife Service The popular photography contest will also be open to Great Backyard Bird Count participants again this year. 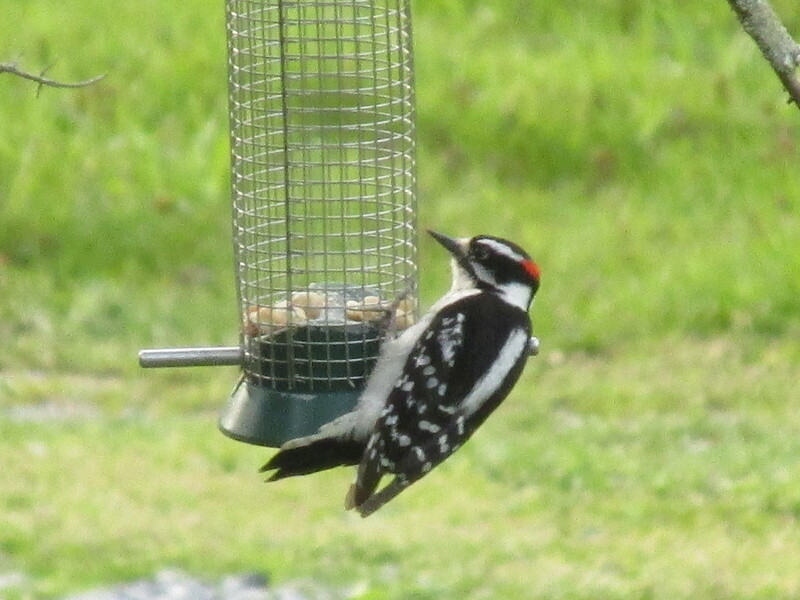 From common birds, such as this Downy Woodpecker, to more exotic ones such as Snowy Owls, photographers can focus their cameras on a variety of birds. The Great Backyard Bird Count is a great way for people of all ages and backgrounds to connect with nature and show some love for the birds this Valentine”s Day. Participation is free and easy. To learn more about how to join the count, download instructions, a slide show, web buttons and other materials, visit http://www.birdcount.org. While you’re there, get inspired by viewing the winning photos from the 2014 GBBC photo contest. I’ve taken part in the GBBC for the past 18 years. It’s easy to do. If you have never participated in the GBBC or any other Cornell Lab citizen-science project, you’ll need to create a new account. If you already created an account for last year’s GBBC, or if you’re already registered with eBird or another Cornell Lab citizen-science project, you can use your existing login information. On any or all of the days of the GBBC, count birds for at least 15 minutes, although you can count for longer than that if you wish. Count birds in as many places and on as many days as you like—one day, two days, or all four days. Submit a separate checklist for each new day, for each new location, or for the same location if you counted at a different time of day. Estimate the number of individuals of each species you saw during your count period. Photo by Byron Tucker A Red-tailed Hawk visits a backyard in an Atlanta suburb earlier this month. GBBC participants can count the birds in their own yards or visit their favorite birding locations to look for everything from raptors and sparrows to finches and waterfowl. Enter your results on the GBBC website by clicking “Submit Observations” on the home page. Or download the free GBBC BirdLog app to enter data on a mobile device. If you already participate in the eBird citizen-science project, please use eBird to submit your sightings during the GBBC. Your checklists will count toward the GBBC. To learn more, again simply visit http://www.birdsource.org. I’m optimistic you’ll join me this year in taking part in the Great Backyard Bird Count. This entry was posted in Birding, Birds, Great Backyard Bird Count and tagged Birding, birds, Bristol Herald Courier, Carter County Compass, Elizabethton Star, Erwin Record, Great Backyard Bird Count, Our Fine Feathered Friends, Winter birds on February 1, 2015 by Bryan Stevens. 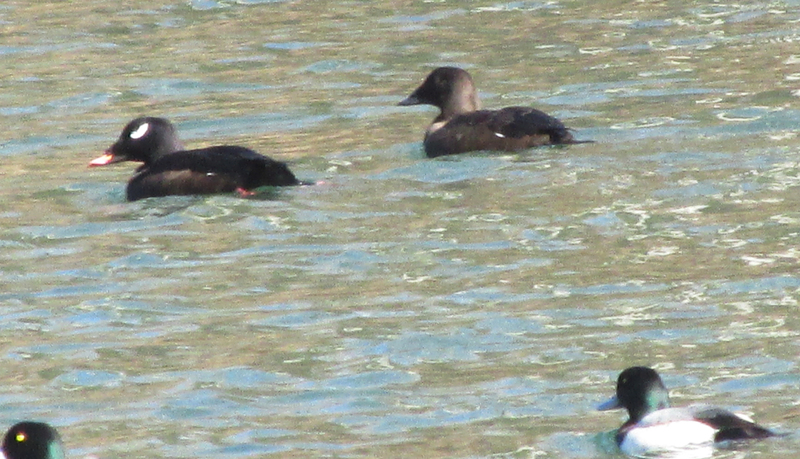 A pair of White-winged Scoters, back, swim on the Watauga River in Elizabethton with three Greater Scaups. Last month’s Great Backyard Bird Count certainly merited description as a global affair. Checklists came in from more than 103 countries, including Australia, China, Argentina, Kazakhstan, Iceland, India, Kenya, as well as Canada, the United States and Mexico. Birders fanned out at hot spots around the world to count birds from Friday, Feb. 14 to Monday, Feb. 17. Participants in the 2013 GBBC tallied more than 40 percent of the world’s bird species, with organizers setting a goal to take that figure to 50 percent this year. A total of 644 species were found within the United States during the 2014 GBBC. California, Texas and Florida led the count with 364, 349 and 305 species found within those states, respectively. In Tennessee, a total of 139 species were found during the GBBC. That’s a far cry from the 201 species located by sharp-eyed birders in Georgia, 200 species found in North Carolina, 184 species identified in both Alabama and Mississippi, as well as the 180 species counted in Virginia. Arkansas eked past Tennessee with 141 species found, but Tennesseans did better than Missouri, where GBBC participants tallied 133 species, and Kentucky, where counters found 128 species. 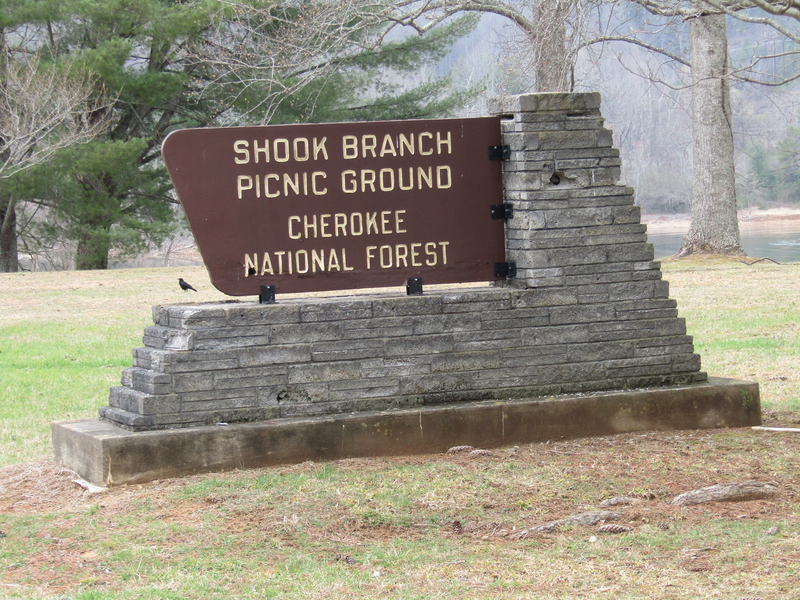 A total of 2,357 checklists were completed by Tennessee GBBC participants, which provided some extensive coverage across the Volunteer State. With 100 species, Hamilton County proved the most productive Tennessee county, followed closely by Shelby and Knox, with 98 and 97 species, respectively. Closer to home, results were less dramatic but still important. In Unicoi County, nine participants, including myself, found 39 species of birds during the four-day count period. In Carter County, 49 species of birds were found by 14 participants, including myself. I mostly counted at home during this year’s GBBC, but I did make trips to the pond at Erwin Fishery Park and Roan Mountain State Park to expand my birding territory. As checklists poured in from GBBC participants, a few trends became clear from the early stages of this year’s count. For instance, this year lacked any evidence of a “superflight” of irruptive finches. Last year the GBBC documented such a phenomenon, which was driven by food shortages in Canada. Ten species of irruptive birds (mostly finches) staged a record invasion in areas where they don’t usually show up. This year lacked huge numbers of White-winged Crossbills, Red Crossbills, Common and Hoary Redpolls, Pine and Evening grosbeaks, Pine Siskin, Purple Finch, Red-breasted Nuthatch and Bohemian Waxwing, birds that were more numerous farther south last year as well. On the other hand, the 2014 GBBC has confirmed that this has been a great year for spotting Snowy Owls across the United States. A massive irruption of Snowy Owls into the northeastern, mid-Atlantic and Great Lakes states had already been producing headlines for the past several months. Halfway through the GBBC, with 327 checklists reporting a total of 476 Snowy Owls in 20 states and provinces of the United States and Canada, it was clear that many of the Snowy Owls had found their winter homes to their liking. Last year, 392 owls from eight provinces and 14 states were all that were counted during all four days of the 2013 GBBC. As an illustration of how the owls have moved, in 2013 Canada had 46 percent of the Snowy Owl reports, but this year that number has dropped to 32 percent. Despite this year’s impressive numbers, these large, white owls can still be hard to find. Many GBBC participants succeeded by checking seashores and lakeshores, farm fields and even cities, where the owls often choose a prominent perch with a good view, such as a utility pole or even the roof of a city building. In much of North America, people (and birds) have been shivering through bone-chilling blasts of arctic air also called the “polar vortex” phenomenon. The impact of this extended cold on birds has beens most apparent in areas such as the Great Lakes, which are almost completely frozen. Only Lake Ontario has any significant open water now and that has resulted in major movements of waterfowl such as ducks, geese and grebes. The GBBC is capturing these patterns well. For example, the White-winged Scoter is not usually found inland in February, but has been widely reported from interior locations over the past few days as has the Long-tailed Duck. Both these species showed up in unusual numbers in Northeast Tennessee during late January and throughout February. These two White-winged Scoters spent several days in late January and early February on the Watauga River near Meredith Cabins in Elizabethton. A pair of White-winged Scoters spent several days on the Watauga River near Meredith Cabins in late January and early February. My mom and I managed to get good looks at the two ducks on Feb. 1. By climbing down a tangled bank, I also managed to get some decent photographs of them. White-winged Scoters are large, solidly built ducks. Males can weigh three-and-a-half pounds while females can reach a weight of two-and-a-half pounds. Both sexes have the vivid white wing patch that gives the duck its common name. This duck nests on freshwater lakes and wetlands in the northwestern interior of the United States and Canada. Other scoters include Surf Scoter, Velvet Scoter, Black Scoter and Common Scoter. Surf and Black Scoters are also occasional visitors to Northeast Tennessee. A total of 62 White-winged Scoters were found in Tennessee during this year’s GBBC. Three Surf Scoters were also found. The scoters are classified with the diving ducks. To learn more about scoters and other diving ducks, here’s a helpful link to a PDF with detailed information about various species, including White-winged Scoter. According to an update regarding the GBBC posted at birdcount.org, one of the more exciting rare birds reported in this year’s GBBC was spotted across the pond. A Yellow-rumped Warbler has been visiting a feeder in, of all places, central England! This is the first New World warbler ever recorded for the GBBC from the Eastern Hemisphere. 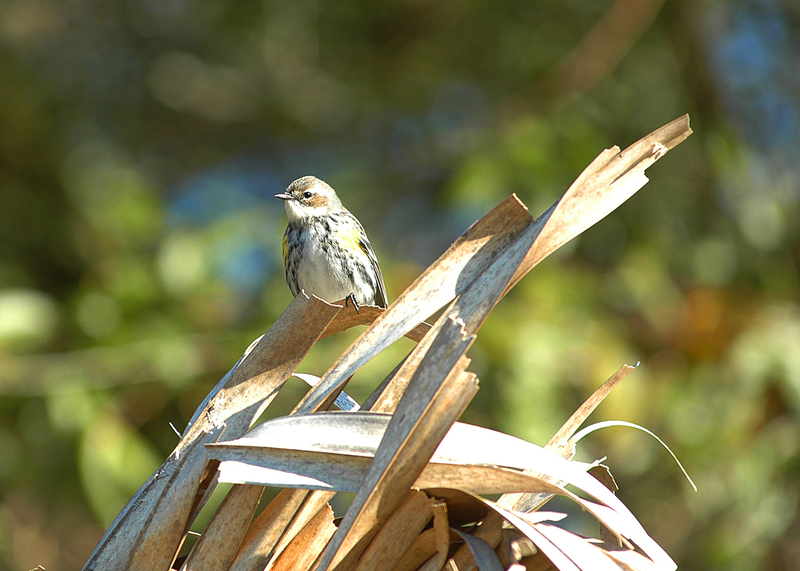 This Yellow-rumped Warbler was photographed on Fripp Island, S.C., several years ago. In northeast Tennessee, the Yellow-rumped Warbler, many years ago known as Myrtle’s Warbler, is a common winter bird. Indeed, it is the only warbler that typically attempts to spend the winter months in the eastern United States. I would love to hear from readers. Just post comments on my new blog at ourfinefeatheredfriends.wordpress.com. You can also reach me on Facebook or send email to ahoodedwarbler@aol.com. Please share the link to the blog with others who might be interested in the topic of birds and birding in Northeast Tennessee. This entry was posted in Birding, Birds and tagged Birding, birds, Elizabethton Star, Erwin Record, Great Backyard Bird Count, scoters, warblers, White-winged Scoter, Yellow-rumped Warbler on March 2, 2014 by Bryan Stevens.